Champaka is a holistic flower with hundreds of references in the folk lore & legends of Hindu mythology. These flowers produce an exquisite and heady fragrance just before sunset, when they bloom. The petals resemble the hood of a snake. Hence the name Nag Champa. In many Indian Languages Nag means Snake. Description & History: Nag Champa is one of the flowering trees of the Magnoliaceae family with bright Orange Yellow flowers. Michelia Champaka Alba is a close relative of Michelia Champaka producing white flowers with more or les the same aromatic compounds. Champaka is a holistic flower with hundreds of references in the folk lore & legends of Hindu mythology. It is also refered to in many classical medical textbooks of ancient India. 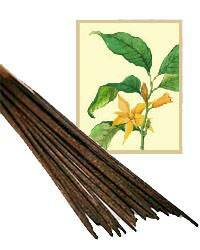 The fragrance resembles Yalang-Yalang, though Yalang-Yalang is sweeter in comparison to Nag Champa. These flowers produce an exquisite and heady fragrance just before sunset, when they bloom. The petals resemble the hood of a snake. Hence the name Nag Champa. In many Indian Languages Nag means Snake. Major Producers: India (East, South and Himalayan Foot Hills). Aroma: Flowery Sweet, Lingering and slightly heady. Parts used to make incense: Flowers & Leaves. Aromatic / Medicinal properties: Diuretic, Anti Rheumatic, Stimulant, Purgative & Expectorant. 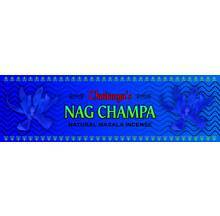 Contemporary Applications: Nag Champa is arguably, the most popular incense in the world. The extracts from this plant is widely used by the Perfume industry, and the various traditional and tribal medicine systems of India. Some popular brands of perfumes in the market such as "Joy", ?J`adore" and "Dior" make use of the fragrance essence which is extracted from the flowers of Nag Champa. The slightly heady, but sweet fragrance of this flower is very popular with many Ashrams and Holistic centers in India, from where it spread out all over the world. As the new age life style became more popular the west, Nag Champa incense took its fair share. As a result, it is THE MOST popular and (hence) the most faked incense in the world. Making Nag Champa Incense: For making Radha-Madhava Nag Champa incense, high grade Nag Champa essential oil is sourced, fresh from the extraction units located in Orissa, Karnataka & Tamil Nadu. This Oil is blended and mixed with the rest of the masala ingredients to create the finest Nag Champa incense. We urge incense lovers to try the Radha-Madhava Nag Champa, and compare it with other popular brands of Nag Champa incense.